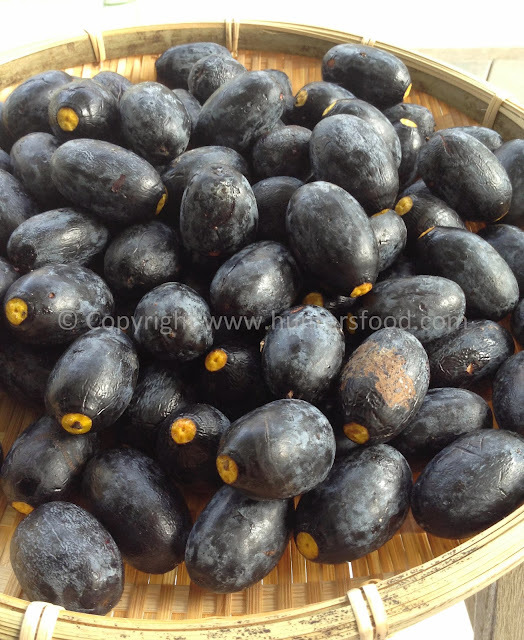 Buah dabai, with its scientific name as Canarium odontophyllum, is very unique to Sarawak. 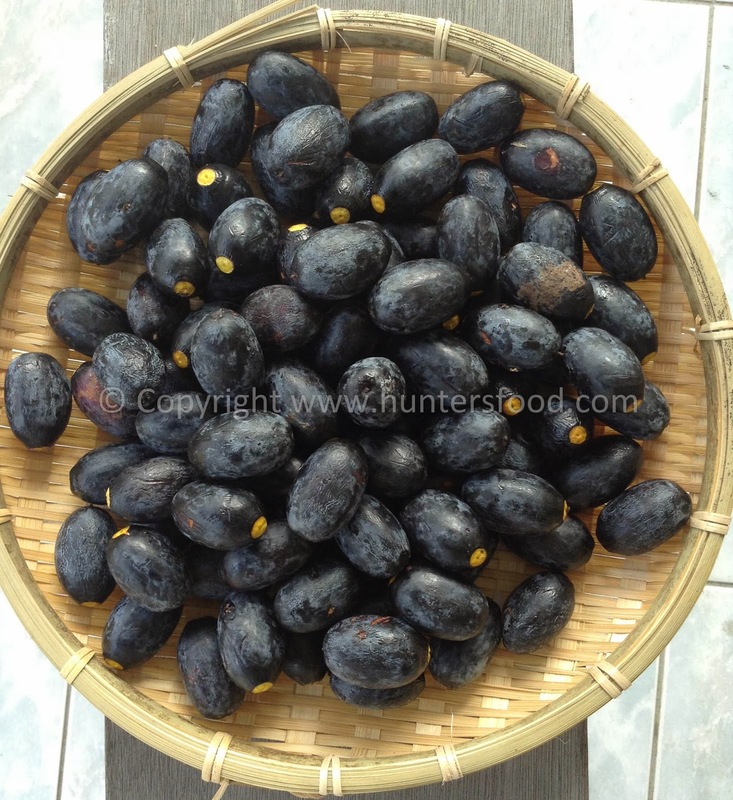 A very good information for buah Dabai can be found at this site. Many of my friends and ex-colleagues from Peninsular Malaysia, including Sabah were curious about this seasonal fruit and asked me how it tasted, but it was something that is very difficult to describe and has to be experienced personally. It does not have distinct smell, however it relies on the taste of the flesh which is creamy and soft in texture. One will either love it, or won't get it as it is actually an acquired taste. It took me almost 3 seasons (3 years) to actually get the idea of what dabai is about. And when I finally got it, I was madly in love with it. Not just the flesh can be consumed, but the seed inside the kernel can also be eaten. However, as it may be a bit troublesome to crack the tough kernel, normally it is just discarded. 4. Eaten by itself or with white rice. *If the flesh turn purplish, the dabai is overcooked. 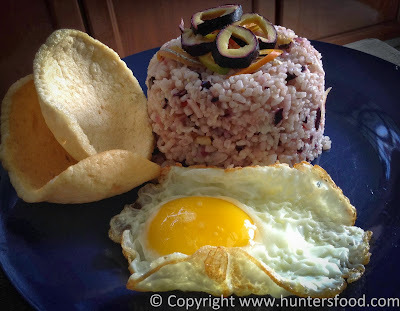 This is my own version of Dabai Fried rice. You can cook it the way you like it as long as the dabai is pre-soaked in hot water and deseeded. 1. 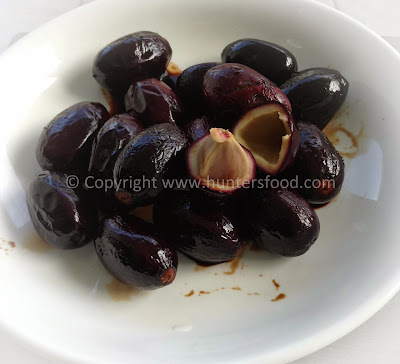 Buah Dabai - soaked in hot water for 10-15 mins. Drain, pit the flesh and add salt. 1. Saute garlic and shallot until fragrant. 2. Add in dabai and chilli. Stir. 3. Add in rice. Mix well. 4. Season with salt and/or oyster sauce. *Revisit : A better way to prep buah dabai is to add half of room-temperature water, then half with boiling water. Pls ensure water is covering the whole dabai. When dabai is soft, it's ready to be consumed. Prepare this way will ensure dabai will cooked away slowly and the creaminess is preserved. OMG.. now I wanna eat this..